Skills mismatches and anticipation of the future labour market need: Case of Croatia Predrag Bejakovic, Institute of Public Finance, Zagreb, Croatia. 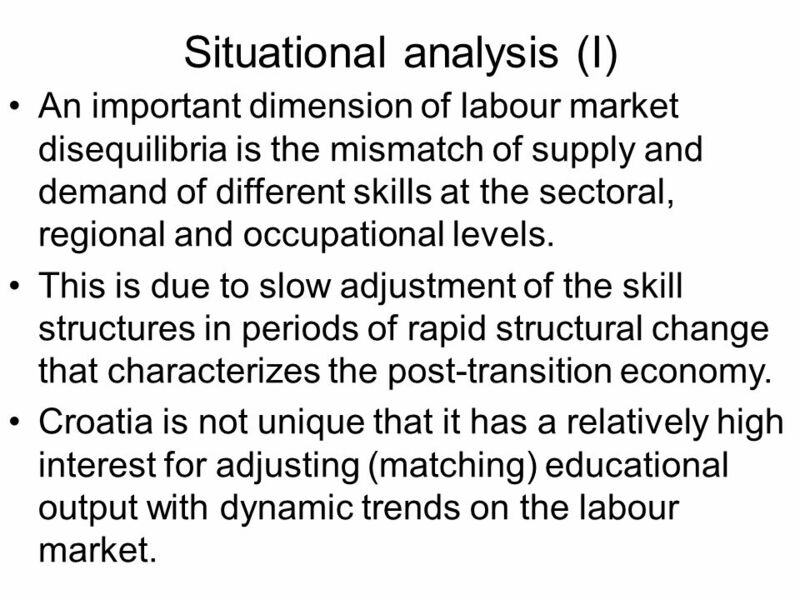 2 Situational analysis (I) An important dimension of labour market disequilibria is the mismatch of supply and demand of different skills at the sectoral, regional and occupational levels. This is due to slow adjustment of the skill structures in periods of rapid structural change that characterizes the post-transition economy. Croatia is not unique that it has a relatively high interest for adjusting (matching) educational output with dynamic trends on the labour market. 3 Situational analysis (II) No doubt that skills and competences are among the most important determinants of individuals position on the labour market and thus, key preconditions of ones employability and employment prospects. If person is unemployed for a long period he or she is much more exposed to poverty and social exclusion. The main reasons for the high unemployment incidence of young people in Croatia are lacking work experience and widespread skill mismatches. 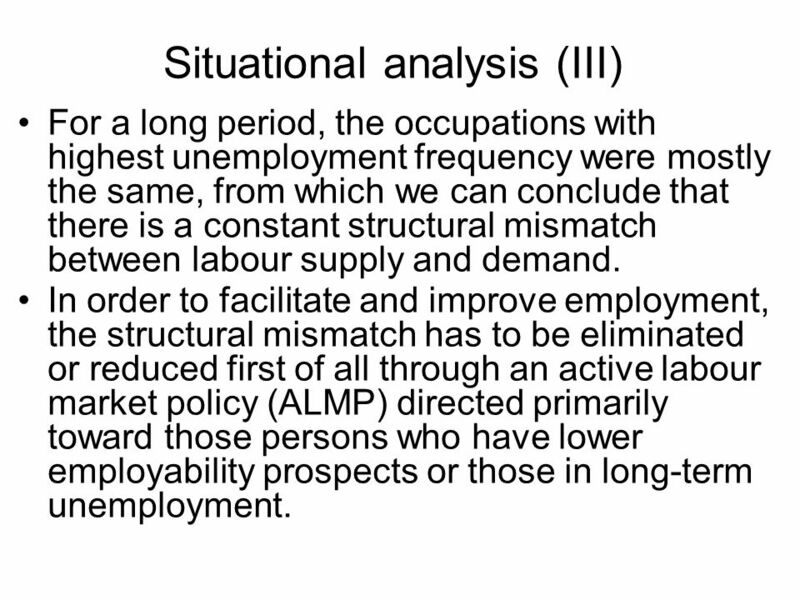 4 Situational analysis (III) For a long period, the occupations with highest unemployment frequency were mostly the same, from which we can conclude that there is a constant structural mismatch between labour supply and demand. In order to facilitate and improve employment, the structural mismatch has to be eliminated or reduced first of all through an active labour market policy (ALMP) directed primarily toward those persons who have lower employability prospects or those in long-term unemployment. 5 Situational analysis (IV) The Survey on educational and employment careers of the youth analysed two dimensions of the mismatch. 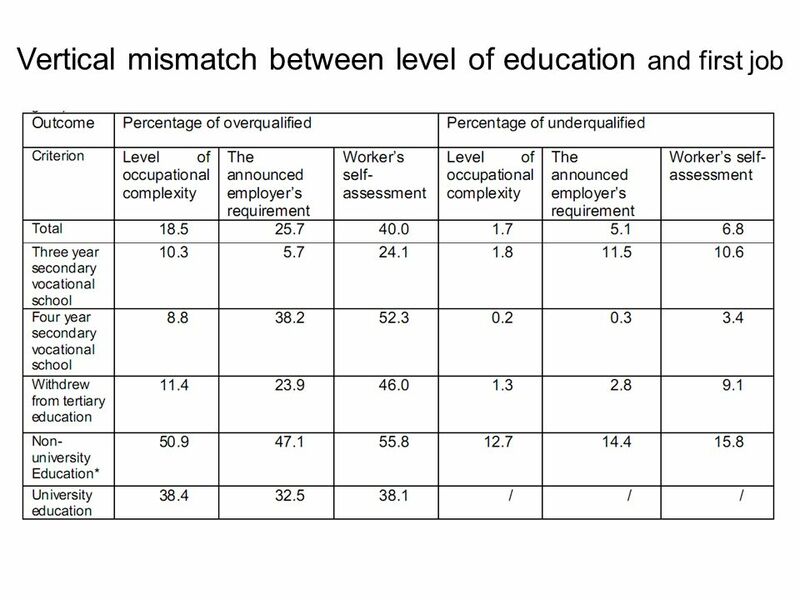 Vertical shows that attained education level is inappropriate to the education level required for a particular occupation: person is overeducated or undereducated for job where he or she is working. 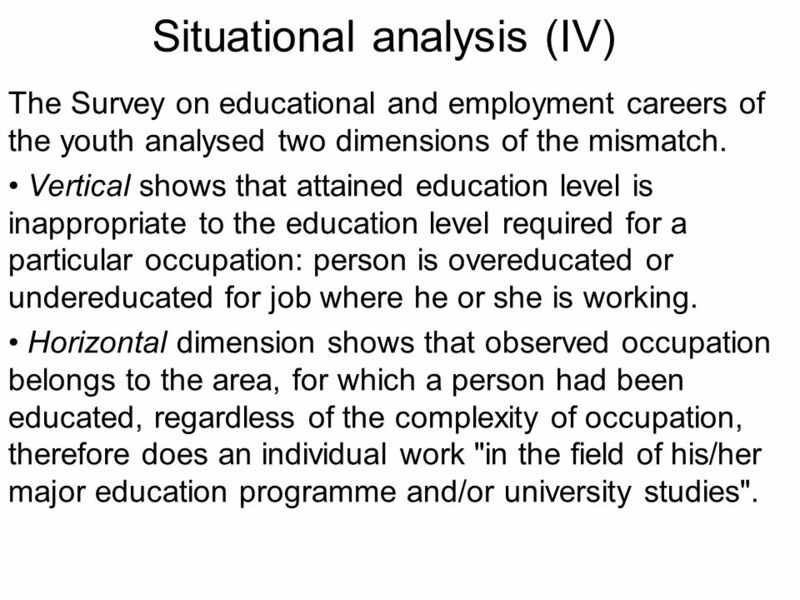 Horizontal dimension shows that observed occupation belongs to the area, for which a person had been educated, regardless of the complexity of occupation, therefore does an individual work "in the field of his/her major education programme and/or university studies". 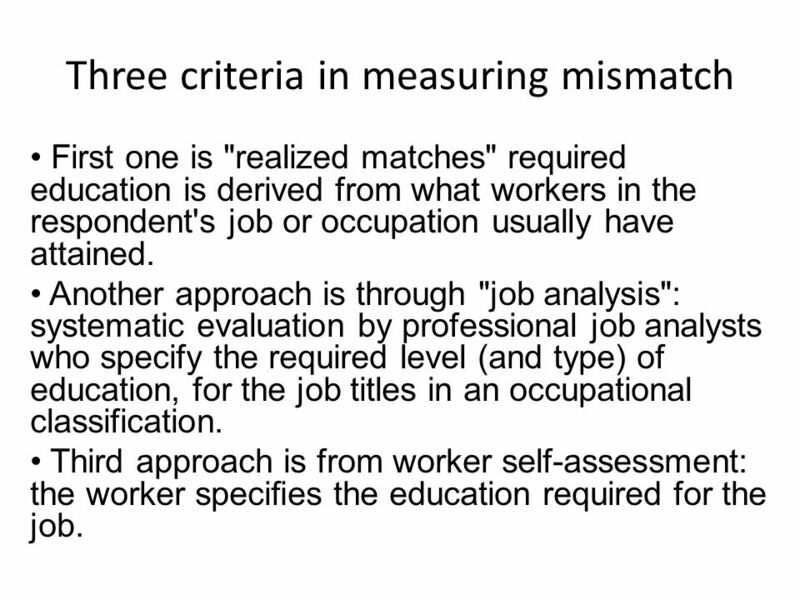 6 Three criteria in measuring mismatch First one is "realized matches" required education is derived from what workers in the respondent's job or occupation usually have attained. Another approach is through "job analysis": systematic evaluation by professional job analysts who specify the required level (and type) of education, for the job titles in an occupational classification. Third approach is from worker self-assessment: the worker species the education required for the job. 9 Vertical mismatch during professional development Number in brackets represents a frequency of horizontal transition where the job changes occurred. 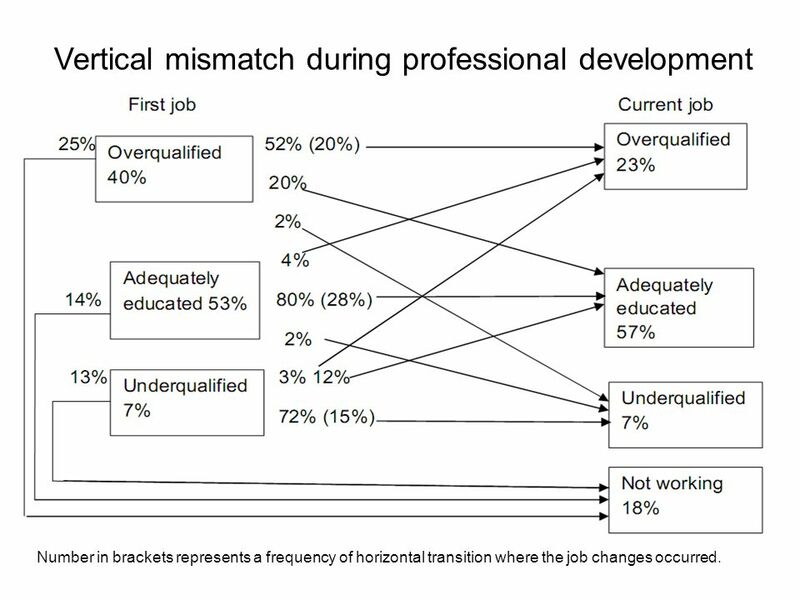 10 Horizontal mismatch during professional development Number in brackets represents a frequency of horizontal transition where the job changes occurred. 11 Regardless of methodological problems and a lack of reliable data It is quite obvious that the overquafication is relatively common at all educational levels. It is rarest by employees with three year secondary school who mostly believe how their jobs are adequate to their qualification. However, even in that educational group, one fourth of persons believe that for their jobs there is no need for secondary education. Overquafication is more common by employees with university education, where two from five people that had worked on the first yobs believed that their work does not need knowledge and competence acquired by university study. By all other educational groups around a half of youth employees believe that they are overqualified for their job. 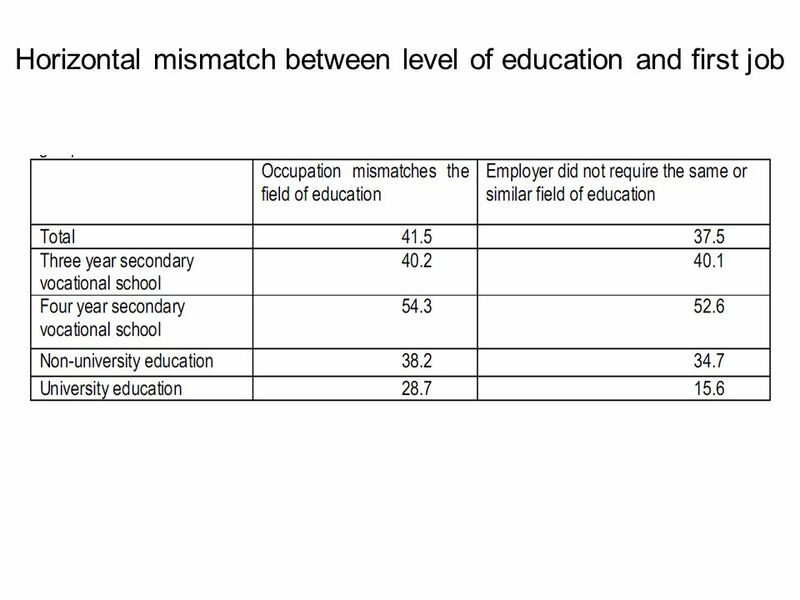 13 Vertical mismatch according to the LFS While by people with secondary education around one third did not work on first jobs adequate to their field of major education programme and educational attainment level, by those with university education in similar situation were one fourth of young people. 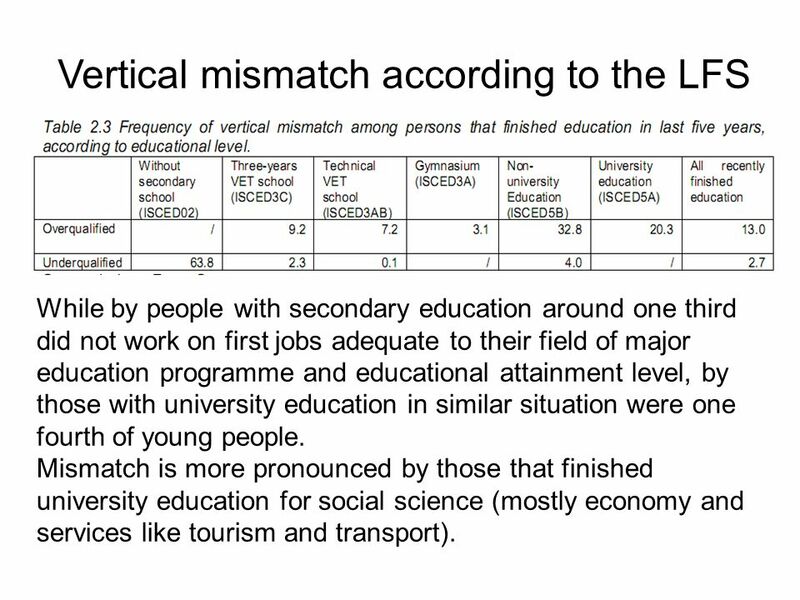 Mismatch is more pronounced by those that finished university education for social science (mostly economy and services like tourism and transport). 14 Anticipating skill demands In Croatia there are problems not only in insufficient attention to the future labour market and skill needs, but also there is a very week relationship between current educational outcome and labour market needs. Little connection seems to exist between the number of people who are enrolled in programs and the labour market demand for graduates of such programmes. For example, political science and journalism graduates have average job accession rates of 25% in the year after graduation. However, the number of first-year students enrolled in these programs has grown at a greater-than- average-rate. Even if such individuals find a job, it is likely that it will be outside their field of study. 15 The Croatian Employment Service on employers needs The questionnaire asks questions related to the requirements regarding occupation, knowledge and skills of the possible employees with the purpose to propose measures for better adjustments of demand and supply on the labour market. Most employers underlined that they had problems finding employee(s) with adequate qualifications and professions but very often they also complained about the lack of workers with required work experiences. 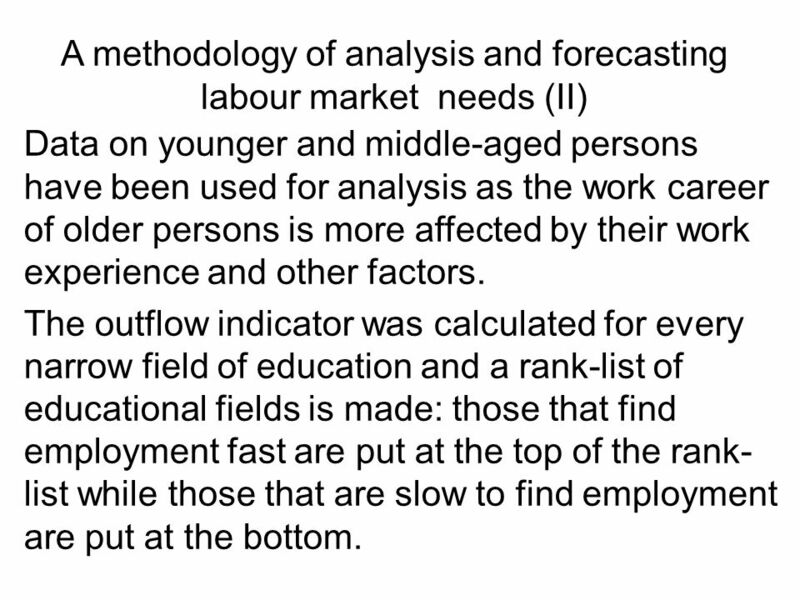 16 A methodology of analysis and forecasting labour market needs (I) For analysis two main data sources were used: the register of the unemployed and an employers survey. 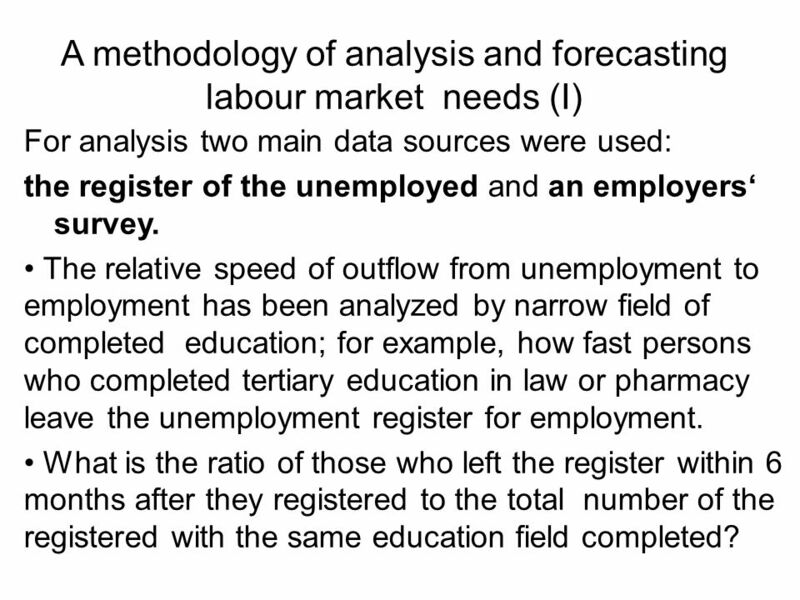 The relative speed of outflow from unemployment to employment has been analyzed by narrow field of completed education; for example, how fast persons who completed tertiary education in law or pharmacy leave the unemployment register for employment. What is the ratio of those who left the register within 6 months after they registered to the total number of the registered with the same education field completed? 17 A methodology of analysis and forecasting labour market needs (II) Data on younger and middle-aged persons have been used for analysis as the work career of older persons is more affected by their work experience and other factors. The outflow indicator was calculated for every narrow field of education and a rank-list of educational fields is made: those that find employment fast are put at the top of the rank- list while those that are slow to find employment are put at the bottom. 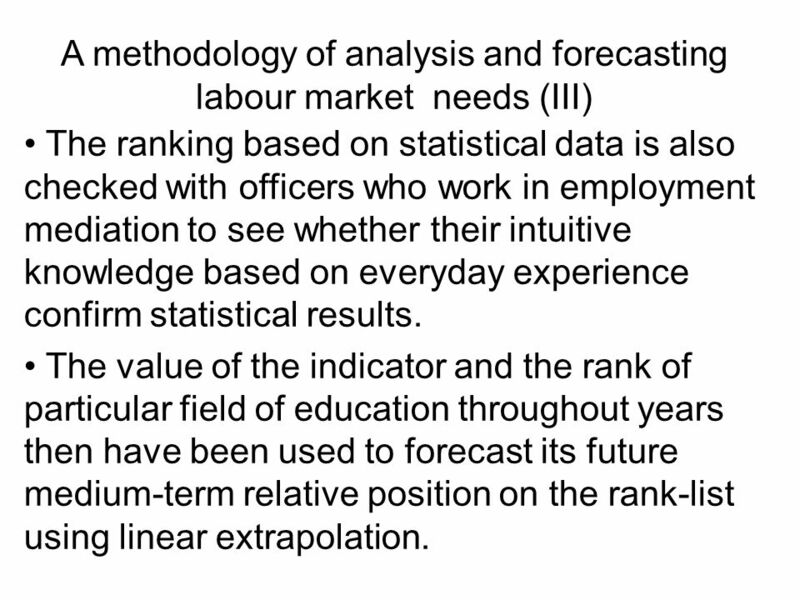 18 A methodology of analysis and forecasting labour market needs (III) The ranking based on statistical data is also checked with officers who work in employment mediation to see whether their intuitive knowledge based on everyday experience confirm statistical results. The value of the indicator and the rank of particular field of education throughout years then have been used to forecast its future medium-term relative position on the rank-list using linear extrapolation. 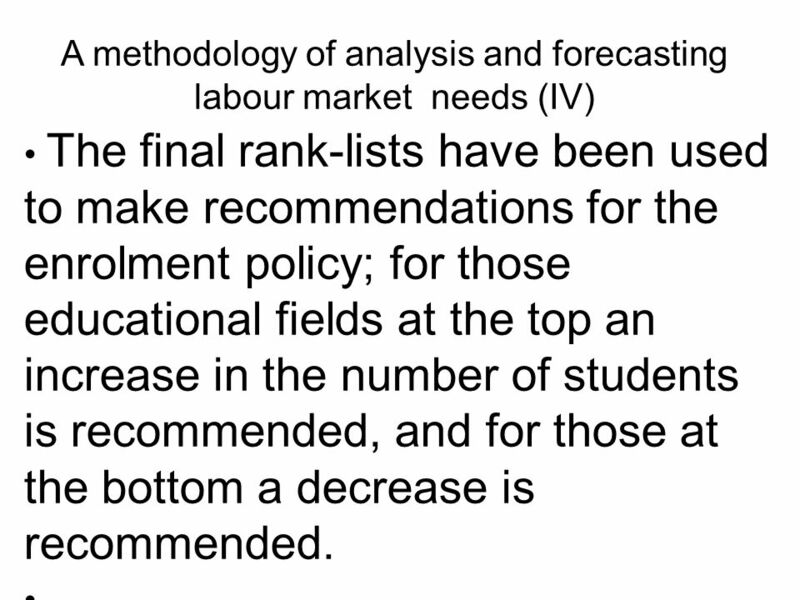 19 A methodology of analysis and forecasting labour market needs (IV) The final rank-lists have been used to make recommendations for the enrolment policy; for those educational fields at the top an increase in the number of students is recommended, and for those at the bottom a decrease is recommended. 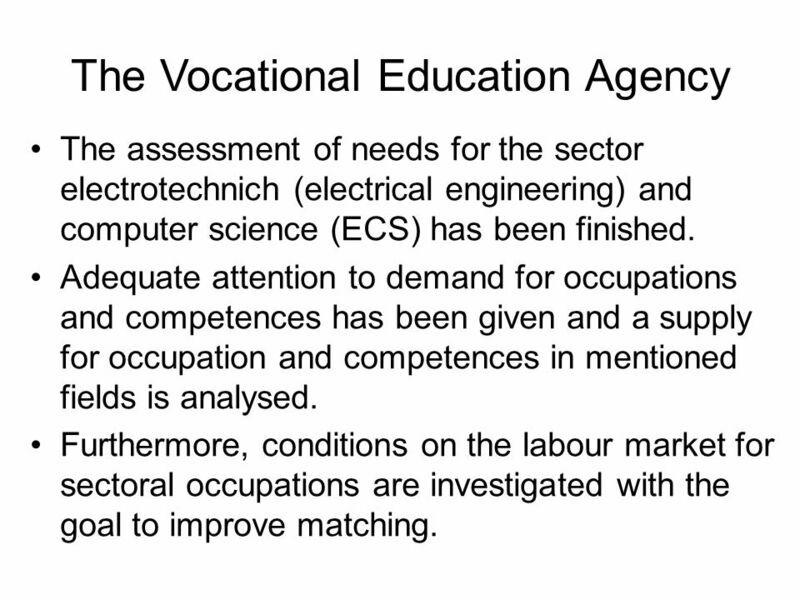 20 The Vocational Education Agency The assessment of needs for the sector electrotechnich (electrical engineering) and computer science (ECS) has been finished. Adequate attention to demand for occupations and competences has been given and a supply for occupation and competences in mentioned fields is analysed. Furthermore, conditions on the labour market for sectoral occupations are investigated with the goal to improve matching. 21 Final message (I) In Croatia there are insufficient links between the education arena, the economy and employers; Not enough attention is given to the estimation of the future trends and needs of the labour force That causes problems in providing education and skills programmes compatible with the skills and occupations sought on the labour market. 22 Final message (II) It is necessary to move from declarative statements to implementation. 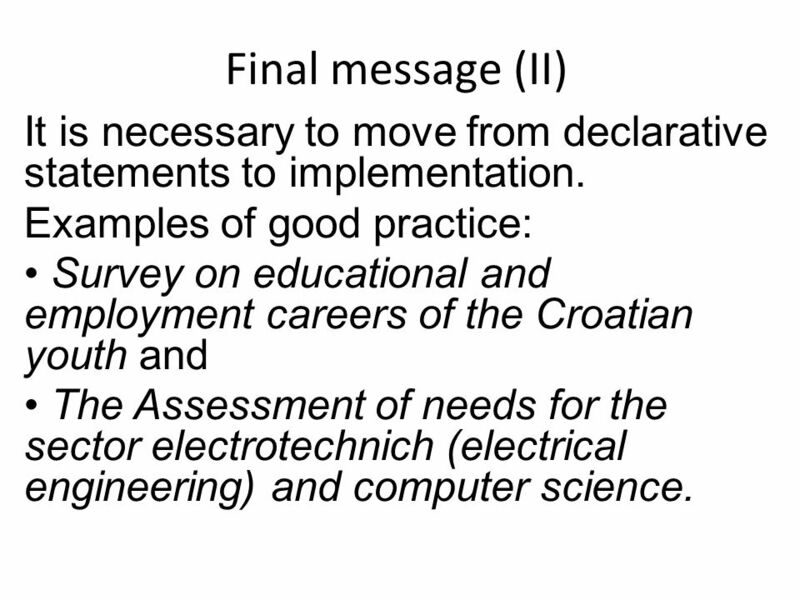 Examples of good practice: Survey on educational and employment careers of the Croatian youth and The Assessment of needs for the sector electrotechnich (electrical engineering) and computer science. 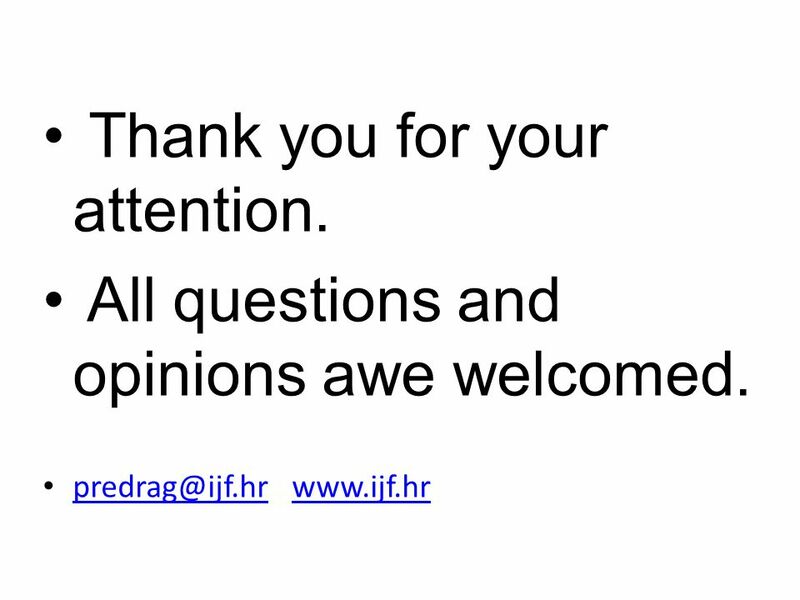 Download ppt "Skills mismatches and anticipation of the future labour market need: Case of Croatia Predrag Bejakovic, Institute of Public Finance, Zagreb, Croatia." What's up with the vocational education? MSDP training, WUS Austria Budva, February 2009 Martina Vukasović Centre for Education Policy Tuning Education Structures to the Needs of the Labour. VOCATIONAL EDUCATION IN CROATIA SWOT ANALYSIS Romania, Sept.2012. Education as Key to Success – The link between vocational schools, lifelong learning and the world of work – « EKS » Slovakia 10-11/06/2014 Final results. Study 3- Labour Market Demand for STEM Occupations February, 2014. SOME QUESTIONS ABOUT EDUCATION AND TRAINING CONCERNING THE LABOUR MARKET IN VIETNAM Dr. Nguyen Ba Can Deputy General Director Department of Facilitates. Appendix Ghana. Conclusion per capita growth is accompanied by an increase in output per worker in the primary and tertiary sectors a decrease in output. UNDERSECRETARIAT OF EMPLOYMENT AND LABOR POLICIY October, 2006. 1 GLOBAL INTEGRATION OF GRADUATE PROGRAMMES GIGP October 2005 Irkutsk, Russia ______________________________________________________ Investigating. Econ 100 Group 6 How to tackle the unemployment problems in Hong Kong? 1 Study visit – EBPM Sweden, May 21-24, 2012 x Lessons Learned Zagreb, 12 February, 2013 Daria Arlavi Head od Section for the Croatian Qualifications Framework. Ministry of Health and Social Development, Russian Federation Labour Market and Employment In The Russian Federation. 12 th National PESO Congress October Baguio Country Club, Baguio City Helping Filipino Youth to a Good Start : Design of a youth employment. Producing migration data using household surveys Experience of the Republic of Moldova UNECE Work Session on Migration Statistics, Geneva, October. Hrvatski zavod za zapošljavanje ACTIVE LABOUR MARKET POLICY AIMED AT YOUTH Ivana Rogina Pavičić, Active Labour Market Policy Division, Croatian Employment. Aiming High: Secondary Education in South Australia Chris Robinson Chief Executive Department of Education and Children’s Services South. The future of labour market in Latvia The future of labour market in Latvia February 27, 2013 1.